Magnetoceptia’s latest performance ‘Tip the Scales in a Gambler’s Favor’ will be presented on the 23rd July 2017 in Hal25 Alkmaar, The Netherlands. The performance has been developed within the context of a Creatorium Residency, with the support of Hal25. This time a platform is created on which the Cheese carriers´guild – ‘Kaasdragers’ of Alkmaar – meet the local radio sending-amateurs. The most simple and versatile methods of telecommunication – semaphore signs and morse code – will serve as optical and audible commands for the Cheese carriers´guild, shaping the composition of the performance. 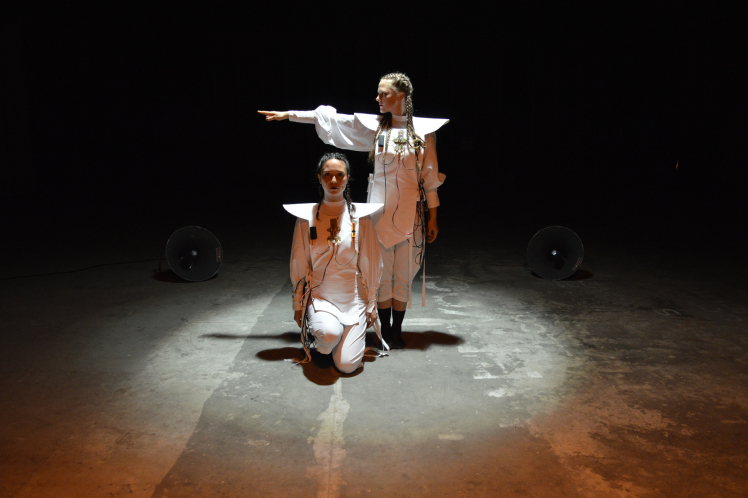 Through the ceaseless clink of their wooden shoes, Dewi de Vree & Patrizia Ruthensteiner alias VICTOR & ROMEO, will transmit codes, evoking a cascade of translations to chase around the cheese carriers. By stepping out of accord, eventually a new language will be created, one that is based on a more physical vocabulary, as a result from walking off the path of the NATO phonetic alphabet. The material and immaterial, the local and the worldwide, the received and the self-generated sounds presented during the performance, will be sent out by the Grand Master of Shortwave controlling an antenna receiving station, to be eventually picked up in distant spheres by a potential observer of the earthly activities. In the lodge of Magnetoceptia’s guild, each member has their own call sign and colour-code to mark their respective roles, placing them in the hierarchy of the performance. White is the colour of the carriers´guild and the mason’s apron (schort), whose enlarged pattern will serve as the stage, a chalk-drawn playground. translations and cascades of re-contextualized actions are evoked. Enclosed male circles will now be stimulated to a dialogue, controlled and directed by VICTOR & ROMEO. Stereotypes will be stretched out and compressed again, sonified and transmitted to another star. All rights reserved by Dewi de Vree & Patrizia Ruthensteiner.